About a year and a half ago one of my defining learning moments as a bassist happened as I was schlepping through my studies and practicing over a summer vacation. 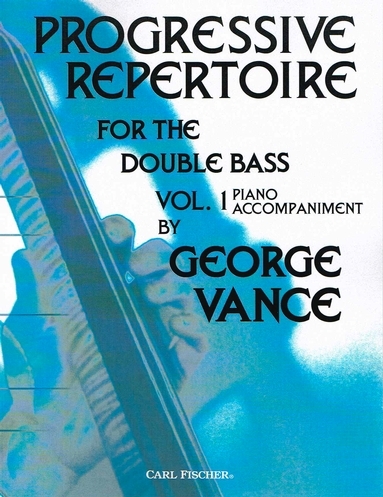 Previously, I had seen a couple students come in for lessons with these Progressive Repertoire for the double bass by George Vance books and at that point in my development I didn’t think that there could be any sort of change to the technique of the upright bass that Simandl hadn’t covered. I knew that I should, for some reason, humbly check into it, so I took some time to dig in and check out this new technique. It didn’t take me long to complete and fall in love with the first two books (yes there two more books building on each other). By forcing myself to go through them meticulously, understanding in my capacity at the time, I had drastically changed how I looked at the bass. I was completely inspired by the straight forward, no messing around method these books permitted. For someone that has gone through the Simandl book, this solidified a lot of things and filled in a lot of gaps that I didn’t know I needed. Starting off with breaking the bass into Six positions by starting off in fourth position D to E on the string G before the break, and then dealing with the essential harmonics of the bass all the way to the third octave D on the treble clef (yes, you are reading in treble clef before the twentieth page)! All of this helps to make the instrument “simpler”, and the technique makes it attainable to know your instrument well. I strongly recommend this for your studies and if you don’t have a teacher to show you how it all works there is a video on Jason Heath’s blog explaining how to get started. I recommend a teacher if you are new to the bass to help you get started on many other aspects that will need to be addressed before you pick up this book. As explanatory note in the book you will read, “The division of the fingerboard into six positions of the hand is the creation of Francois Sabbath. This idea has been thoroughly explicated in his Nouvelle Technique de la Contrebasse (three volumes published by Leduc).